In 1952, she married a Greek sailor named Tosh Angelos. When she began her career as a nightclub singer, she took the professional name Maya Angelou, combining her childhood nickname with a form of her husband's name. Although the marriage did not last, her performing career flourished. Angelou has been married three times or more (something she has never clarified, "for fear of sounding frivolous"). In her third autobiography, Singin' and Swingin' and Gettin' Merry Like Christmas, Angelou describes her three-year marriage to Greek sailor Tosh Angelos in 1949. Up to that point, she went by the name of "Marguerite Johnson", or "Rita", but changed her professional name to "Maya Angelou" when her managers at San Francisco nightclub The Purple Onion strongly suggested that she adopt a more theatrical name that captured the feel of her Calypso dance performances. She won a scholarship and trained in African dance by Trinidadian dancer Pearl Primus, in 1952. Angelou married Tosh Angelos, a sailor of Greek decent, in 1952, but Tosh's atheist ideals grew to be unacceptable to the devoutly religious Maya, and the marriage soon soured. 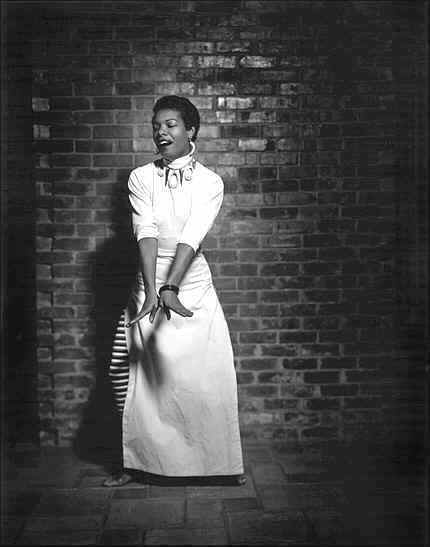 Angelou's characteristic determination to emerge victorious from defeat, led her to a job as a dancer and bar girl in a strip joint where, once again, against all odds, she would reap success in the midst of meager circumstances.